I was recently told that my blog, published in September for the European Association of Palliative Care (EAPC), was number eight in ‘most viewed in 2016’ list. Why was this I wonder? Did the informal style draw potential users in? Waiting for a meeting? Travelling on a train? A spare 20 minutes before lunch? Why not open an e-ELCA e-learning session and learn something new? Of course, members of the EAPC will think end of life care important, but was it the information about accessing on-line learning that was of prime interest to them especially those in Europe who can access the amazing content of over 160 sessions through purchase via e-Integrity? Was it the Twitter sphere? @Cmf_elca doesn’t have a great following but those that follow me have a huge network across health and social care communities. Did those six retweets make a difference I wonder? I’m not sure whether these were the key factors but I do know that the value of e-ELCA to teachers and learners seems to be increasing and the launch and completion of session data has shown dramatic rises in the past 18 months. Two factors are very definitely key to this. Firstly support from e-LFH on developing a targeted marketing and communications plan. This has included attending many national and regional conferences, handing out leaflets contributions to workshops and poster presentations. Many specialists in palliative care are using the sessions within their teaching. For example for a course about advance care planning (ACP) Introduction to Principles of Advance Care Planning may be used to bring course participants to a common level before attending a study day. This ACP course might also make use of e-ELCA material for discussion within a group (for example How to Negotiate Decisions Which May be Difficult to Implement) and perhaps as a way to consolidate or further learning (for example Developing Your Practice: Clinical Supervision and Further Reading). 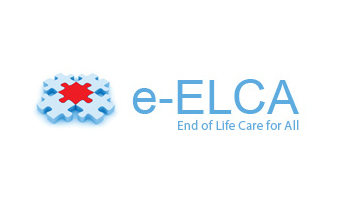 The e-ELCA session that is my personal favorite is Spirituality and Philosophy of End of Life Care. It’s a session that makes me think and reflect even after over 25 years of supporting people who are dying. The importance of the holistic approach to people in finding themselves, is so beautifully articulated through a patient video. A good way to spend those 20 minutes!